The numerous options for transportation in Kuala Lumpur make getting around Malaysia's capital easy, even for first-time visitors. Although busy, public transportation in Kuala Lumpur is reasonably priced and fairly intuitive. The extensive rail network connects all the way to Thailand and Singapore. Even getting around KL by monorail is an option! Although the sidewalks seem to be in a state of perpetual construction and jammed with pedestrians, all the tourist sights around Kuala Lumpur are perfectly walkable. Distances aren't extreme, however, navigating on foot can sometimes be a bit of a challenge. Unexpected walls, sidewalk closures, and other obstacles don't always show up on Google Maps. Walking popular routes such as from Chinatown to the Bukit Bintang area (25 minutes), requires numerous street crossings in complicated interchanges. The walk/don't walk indicators aren't always functioning, and motorists often ignore signals altogether! Proceed with caution and cross in groups so that you'll be more easily seen. Unfortunately, cycling as a way to get around in Kuala Lumpur is practically nonexistent. The overcrowded sidewalks with broken tiles are less than ideal. Cycling on the busy roads without bike lanes is more dangerous than in cities such as Singapore. With bustling KL Sentral — the largest train station in Southeast Asia — serving as the hub, three ambitious rail systems tie the city together. The RapidKL LRT and KTM Komuter trains service over 100 stations, while the KL Monorail connects 11 more stations dotted around the city center. The KLIA Ekspres trains connect the two airport terminals with the city center. Don't let KL's colorful rail map make you nervous. 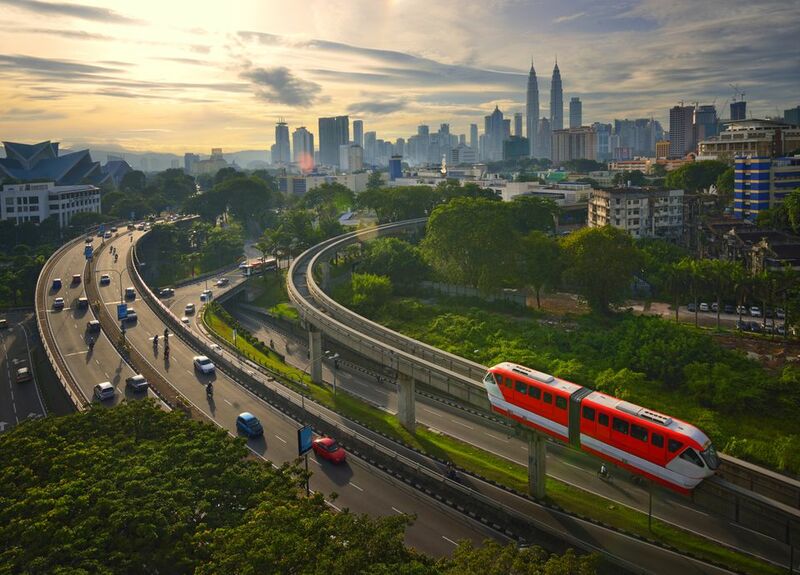 Although seemingly complex at first glance, the trains are actually an efficient, economical alternative for avoiding some of Kuala Lumpur's infamous traffic. Intercity buses in Kuala Lumpur are an extremely cheap option for getting around, however, they are frequently crowded and make frequent stops in heavy traffic. Figuring out the train and walking the difference on foot is often way more efficient than wrestling with Kuala Lumpur's traffic. Many long-haul buses from Kuala Lumpur to destinations such as Penang and the Perhentian Islands depart from Pudu Sentral (previously called Puduraya) near Kuala Lumpur Chinatown. In an effort to further alleviate congestion in busy KL Sentral station, the Terminal Bersepadu Selatan (thankfully shortened to "TBS") handles many long-haul bus routes. One such destination is Mersing, the jump-off point for Tioman Island. TBS has been in operation since 2011 and continues to grow. The station is located around six miles south of Kuala Lumpur. You can reach TBS via three primary rail systems: the KTM Kommuter, the LRT, and the KLIA Transit. You'll occasionally catch a glimpse of the red, double-decker hop-on-hop-off buses circulating throughout their 22-stop route. The tour buses hit all the major sights in KL while offering commentary in eight languages. As the name suggests, you can get on and off as many times as you like between 8:30 a.m. and 8:30 p.m. with a single ticket purchase. Although the buses are supposed to pass by their stops every 20 or 30 minutes to collect passengers, many customers report waiting longer. Like all road traffic, the buses are subject to rush hour — opt to begin your tour in the morning. Taxis should be a last resort for getting around Kuala Lumpur, both because of the cost and the need to inch through congestion. The drivers are notorious for scamming tourists. If you must use a taxi, insist that the driver uses the meter; they are technically required by law to use it but often try to name a price instead. In general, the red-and-white taxis are the cheapest, while the blue taxis are more expensive. Taxi drivers who loiter around bus and train terminals to stalk tourists are typically the ones who resist using the meter. Even once the meter is turned on, don't be surprised if they do a few circles to run up your fare! The Kuala Lumpur International Airport (airport code: KUL) is an impressive, glass structure located about 31 miles south of the city. KLIA services most transcontinental flights into Malaysia, however, the KLIA2 serves as a hub for AirAsia and other budget airlines. The impressive KLIA2 terminal opened in May 2014 to replace LCCT as the main hub for budget carriers. KLIA2 is located two kilometers from the main KLIA site. A free shuttle runs between the two terminals, or you can grab one of the trains. Subang Airport (Airport code: SZB) was Kuala Lumpur's primary airport before the opening of KLIA in 1998. Today, the airport only services small planes, mostly ones to island and vacation destinations around Malaysia. Subang Airport is the hub for the small budget airline Firefly which flies as far as Koh Samui, Thailand; Medan, Indonesia; and Singapore. The most efficient, albeit costly, way to get from the KLIA and KLIA2 terminals to the city is via the KLIA Ekspres train. Trains runs to KL Sentral Station every 15 - 20 minutes between 5 a.m. and midnight. The journey takes around 28 minutes. If for some reason the KLIA Ekspres train is not running, you can also take the KL Transit train which cost the same but takes around 36 minutes with a few additional stops. Budget travelers with more time than cash can take the Airport Coach Bus to KL Sentral station; the journey can take over 90 minutes, depending on traffic. AirAsia and some other groups also operate buses to and from the airport. Tickets for airport buses can be purchased at the Pudu Sentral station (formerly Puduraya) in Chinatown. Tip: When taking a bus or train to the airport, make sure you know in advance from which terminal your flight will depart! If unsure, allow enough time to take the shuttle (30 minutes) to the correct terminal in case you guess wrong. As of 2011, many buses from Kuala Lumpur to Singapore leave from the new Terminal Bersepadu Selatan (TBS) bus terminal located south of Kuala Lumpur in Selangor.